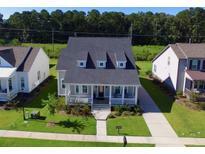 Below you can view all the homes for sale in the Poplar Grove subdivision located in Ravenel South Carolina. Listings in Poplar Grove are updated daily from data we receive from the Charleston multiple listing service. To learn more about any of these homes or to receive custom notifications when a new property is listed for sale in Poplar Grove, give us a call at 843-306-2224. Just off the 4th bedroom is a hidden room that would make a great home office or another bedroom (no closet). MLS#19009311. Carolina One Real Estate. The large first floor owner'ssuite has a huge walk in closet, large linen closet, double sinks, garden tub,s MLS#19008749. Carolina Elite Real Estate. Other features include Rinnia water heater, crown molding, a fully landscaped lawn MLS#19006974. The Boulevard Company, Llc. Upstairs you will find a large bonus room/study that is fantastic, 2 bedrooms and full bath. Screen porch, landscaped back yard, MLS#19006757. Carolina One Real Estate. Upstairs is a loft area, 3 bedrooms, full bath and a large walk-in attic for storage. MLS#19006756. Carolina One Real Estate. Upstairs you will find a loft perfect for an entertainment area or playroom, even a quiet reading nook, 3 bedrooms (one with MLS#19005628. Century 21 Properties Plus. Home is also still under the 2-10 home warranty. MLS#19005457. The Cassina Group. All bathrooms and laundry room have upgraded tile floors. MLS#19005097. Highgarden Real Estate. On the first floor is a formal dining room, living room/office, spacious family room, and beautiful white kitchen which includes 42'' cabinets, tile backsplash, Granite countertops and GE stainless steel gas appliances.This home is perfect for MLS#19004368. Carolina One Real Estate. Enjoy the unique lifestyle that Poplar Grove has to offer and take advantage of the many spectacular amenities provided for its residents including the neighborhood deep-water dock on Rantowl MLS#18009336. Carolina One Real Estate. Where can you live in a gated community with miles of hiking, biking, and riding trails, beautiful paved streets within a gated neighborhood with boat launch,5 miles of water, salt water pool, fitness center..in Poplar Grove just minutes to downtown! MLS#16025251. Southeastern.